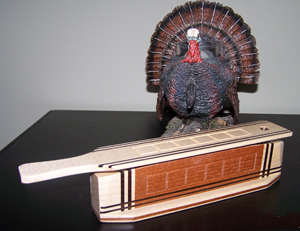 Mann made turkey calls, by Steve Mann. 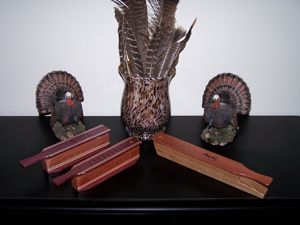 Mann Turkey calls are true hand crafted custom turkey calls. Hand made from scratch using only the finest woods available. It is critical to make a good sounding call. I go through many lids to make sure I get the lid that matches best with that call. Each call is a musical instrument and has to be toned and tuned to get the true turkey sound you are looking for in that call. Neil Cost taught me patience in tuning a call is very important, I allow a lot of setup and tuning time on my calls. I do not let them leave my shop until I am sure they will hold the turkey I put in them. I have been making calls since the early 1990's. I guarantee my calls will provide with you with all the sounds needed to call in gobblers during the season, all you have to do is spend time with that call, practice with it until it takes a set to your way of calling.